The links established through sales of war material by the Spanish State with the Saudi regime, which finances Islamic fundamentalist terrorism purely out of economic and geopolitical interests (these operations help debilitate those governments that are closer to the Russian-Chinese bloc than to the EU-US one, such as those of Syria and Iran, all while yielding substantial profits), are well-known, and other persons and collectives have already pointed them out on social media. In the face of this confrontation between empires that strive for the control of territories and resources, our position as that of libertarian internationalists can only be one of a total rejection of support for any of the contenders in an undeclared world war where it is always we who die. 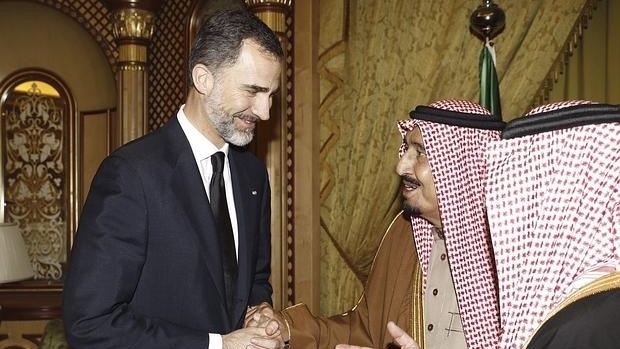 “Dangerous liaisons”: The satraps Felipe VI and Salman of Arabia striking major trade deals such as the sale of arms that would later be passed on to Daesh (January 2017). It is genuinely revolting to watch the entourage of civil, military, and church authorities, all of which are responsible for, and legitimize, the participation of the State in this interimperialist conflict, cry crocodile tears for the bloody consequences that this very conflict has among their subjects/citizens, just as it is truly shameful to see citizens lined up to applaud police corps such as the Urban Guard or the Mossos d’Esquadra1… How easy it is for them to forget the lessons of documentaries such as “Dead City”2 or the pardons granted to the Mossos sentenced for torture! Now it is time to fling ourselves into a grotesque embrace with this impunity, without stopping to consider that the management of everyday matters like security is something of which the State has historically robbed the whole self-organized working people by means of “professionals of violence” whom we have to thank for the kindness of having disarmed us. But what for? Why do they go about taking stabs in the dark, as in the case of the “Dixan Commando”3, in which several people were arrested for the possession of laundry detergent? Or why does nearly half of all arrests for jihadism end up in acquittal due to lack of evidence? Terrorism is much more than just the indiscriminate violence of Daesh: we put up with it every day in the form of workplace accidents when unscrupulous employers increase their profits by skimping on security measures, all with the complicity of system-friendly unions; with the deaths on the roads that are the result of the continued promotion of private transport with multi-million subsidies to the automotive industry, while public transport such as RENFE4 is increasingly deteriorating due to a lack of investment; with the deaths caused by male chauvinist violence, while advertising bombards us with sexist stereotypes that give men the impression that they can have the bodies and even the lives of women at their disposal; with the thousands and thousands of deaths at sea, to which we must add those that take place in the Immigrant Detention Centers (CIE)5 when the doors are closed to people fleeing from the wars brought about by capitalism itself; with the increasingly frequent suicides in places like the subway that the mainstream media is tasked with keeping quiet about, since they are motivated by an economic situation whose culprits are obvious… But of course, this is a “structural terrorism” of the system, one that is more difficult to conceive of as such and whose culprits it is riskier to point out on pain of being arrested, prosecuted, and imprisoned thanks to legal aberrations such as the “Gag Law”6. It is because of this, because of mental apathy and cowardice, that some prefer to appeal to the State for protection so that it “saves” them from that type of terrorism that is seemingly easier to identify, even though it is nowhere near the one that they are most likely to be victims of, but which serves very well as a pretext for implementing measures that set us on the path toward the establishment of an undeclared dictatorship, sacrificing our freedoms for purported security that isn’t. Only the struggle and self-organization of the working class and of the marginalized sectors of a pie that is to be carved up between the usual suspects, as well as the extension of international solidarity to all those who fight against every form of authoritarianism and fundamentalism, can turn the tables in situations like those which we have unfortunately experienced recently. Anything else is a siren song that will only lead us to new and bloody disappointments. Against those who want to foment ethnic and religious hatred to protect their own petty interests: Internationalist solidarity and class struggle for the construction of Libertarian Communism! “If you play with fire, you get burned”: the murder of Juan Andrés Benítez in El Raval (October 2013) by a mob of Mossos. 1. The Catalan regional police force. 2. A 2014 film about the Barcelona “4F case”, uncovering a history of scapegoating, police torture, and the collusion between the local government and the judiciary in its cover-up. See a Libcom article here. 3. A group of 23 Muslim immigrants (mostly Algerians) arrested in 2003 in Barcelona and Girona on charges of plotting a terrorist attack. The “chemical substances” that were seized during the investigation as potential explosives soon proved to be innocuous household products such as laundry detergent, giving the case its popular nickname. 4. The Spanish national railway company. 5. A network of eight detention centers operated by the Spanish Ministry of the Interior, widely criticized for human rights abuses. 6. “Ley Mordaza”, officialy known as the Organic Law for the Protection of Citizen Security, was passed by the right-wing government of Mariano Rajoy in 2015 and restricts rights to freedom of expression and assembly, introducing hefty fines for a range of offenses such as insulting police officers, attempting to stop a home eviction, social media activism, or taking and disseminating unauthorized pictures of law enforcement authorities.